Manual harvest; selection of the best grapes using a sorting table; semi-carbonic maceration for 10-12 days. Vendange manuelle exclusivement, sélection des meilleurs grappes sur une table de tri vibrante puis encuvage pour une macération dite semi-carbonique, de 10 à 12 jours. Aged in large oak barrels (foudres) for 3-4 months. No filtration. Egg white fining. 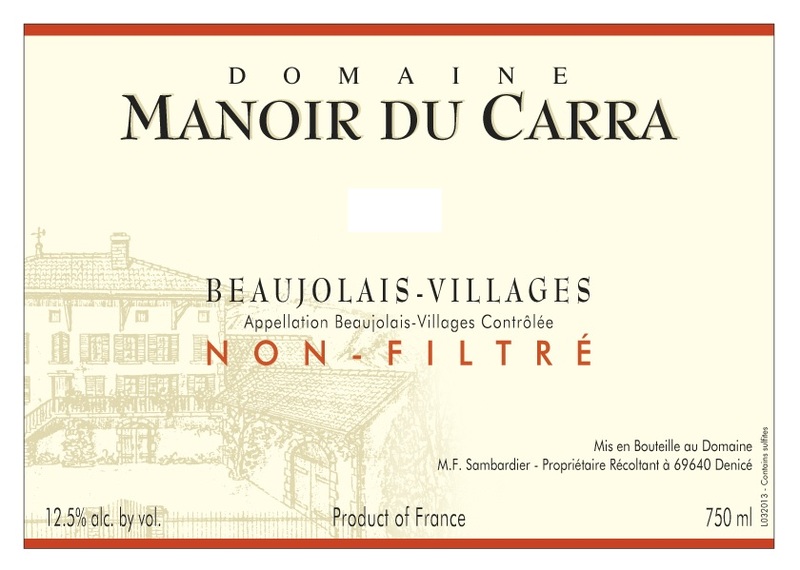 Manoir du Carra Beaujolais-Villages presents with ruby red color, black berry and cherry aromas. Ample in the mouth, very elegant and long lingering finish. Domaine Manoir du Carra is located in the small town of Denice, 5 km from Villefranche-sur-Saone, 45 km south of Mâcon and 40 km north of Lyon. The property dates back to 1850, and has been bequeathed from father to son for five generations. It is now owned by Jean-Noel Sambardier and his wife. Like many Beaujolais producers, part of their wine is sold to negociant, to which they sell at least 25% of their production each year. 30 hectares (74.10 acres) total, divided along the North-South axis between Beaujolais A.O.C (10 ha= 24.70 acres) and Beaujolais-Villages A.O.C. (20 ha=49.40 acres). The Sambardiers own 50 vineyard plots. The vines are 50-100 years old. Yields are 55 hl/ha.